for Sewing, Quilting, Crafts, Hobby Work, Upholstery & More, Start your day by putting on Hand-Mates and your hands will feel more comfortable and relaxed than ever before! Provides massage/heat/support relief from nagging aches and pain. Should be used any time repetitive hand motion causes fatigue to hands or wrist. Naturally generated by the body, warmth is retained within the tightly knit fabric. This keeps muscles relaxed and stimulates circulation. Just like what support hose do for legs... Hand-Mates comfortably reinforce the palm and wrist - leaving your fingers free to handle your work. Insert your ring and middle fingers together through the center hole. 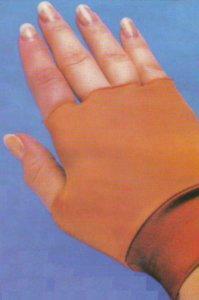 Hand-mates can be worn under protective or sport gloves.